New Teachers’ Contract — Such a Deal! | Look Out Scarborough! 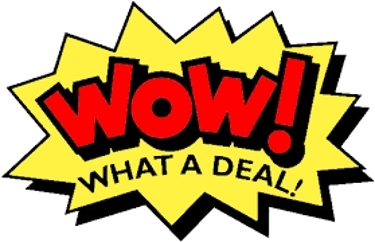 New Teachers’ Contract — Such a Deal! At the School Board meeting on October 20, Superintendent Kukenberger gave the promised analysis of the newly-approved teachers’ contract for Fiscal 2017 through 2019. Let’s start on a positive note by commending the superintendent for providing a thorough, understandable analysis. It was one of the best financial reports we’ve seen from the School Department. We can’t help but wonder… how many Scarborough taxpayers are expecting a 15% increase in their incomes over the next three years. In the current fiscal year, total teachers’ compensation accounts for about 48% of the total school expense operating budget. Yes, this single contract governs 48% of total school expenses. And will for the two years after this, too. Salaries and wages of other employees account for another 27% of total expenses, most of which are also governed by union contracts. Then there are debt service expenses that are “locked in” as a function of borrowing for past capital projects (like the Wentworth School) and equipment. All of which suggest that overall expense growth may approach 5% next budget year – in an environment of very low inflation and flat to modestly declining enrollments. So do not be surprised when the FY 2018 budget starts out with a “level services” budget with an increase of between 4.0% and 5.0% — just to keep the existing programs in place. Please don’t buy it at budget time if you hear salary and benefit costs described as “fixed” or “uncontrollable.” They were indeed very controllable through the negotiation of the union contracts. In the case of the recent teachers’ contract, however, the opportunity to rein in compensation costs was missed. And we will pay the price this year and for the next two years. Another note of caution: In discussions about the contract, you will likely hear emphasis on the modest cost-of-living adjustments or COLA in the contract – 0.5% in year one, 1.0% in year two and 1.5% in year three. (These were corrected from the COLAs announced at the October 6 School Board meeting.) Sounds reasonable enough, right? But then you may also hear something about “step increases.” These are the other and far larger component of pay increases. They are given every year and depend upon the teacher’s years of experience and education level. 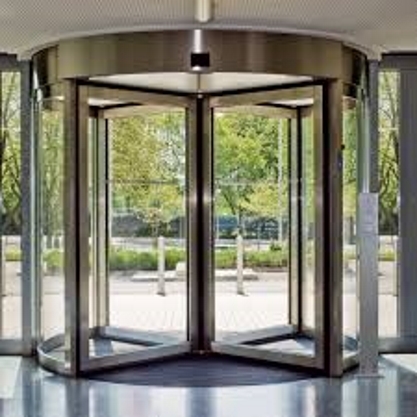 In the past, the impact of the step increases has been glossed over despite the fact that they are the most significant portion of a teacher’s salary increase. As noted in our April 20, 2015 posting, individual teacher salary increases were in the 2.5% to 7.5% per year range in FY 2016 once the step increases were included. The COLA amount is a diversion; the step increases drive total teacher pay. 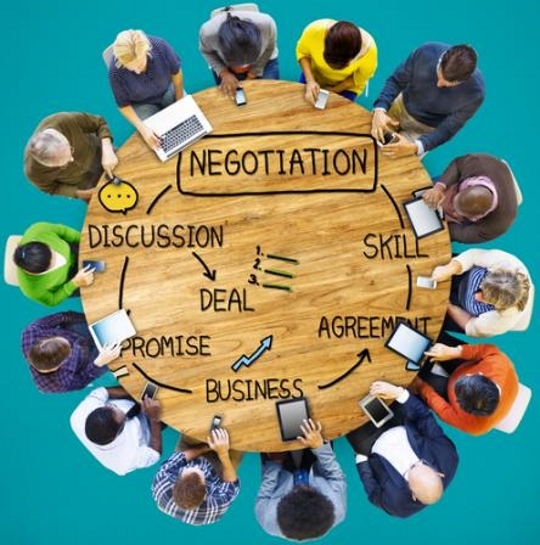 We have always understood “negotiating” to mean the give and take process between two or more parties – each with their own interests, viewpoints and needs – to arrive at an agreement to resolve an issue of common concern. In the public discussions of the negotiations after the contract was signed, we never heard any mention of what the School Board’s financial goals were going into the process. And we can’t recall hearing the teachers’ deal being called a fiscally prudent deal for taxpayers. It was announced that the School Board accepted the union-proposed list of school districts to be used for salary comparisons. Presumably the union came up with the districts with the highest salaries that they could justify (like Falmouth and Yarmouth). And we went along with it. In most negotiating situations, one would expect the other party (i.e., the School Board) to come back with a list of comparable districts with lower salary structures. And then meet in the middle. Also known as compromise. In summary, we’re wondering just who in the negotiations was considering the financial impact the contract would have on Scarborough’s taxpayers. We do, after all, pay the bills. 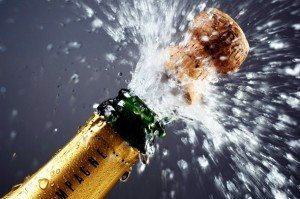 We’re guessing the union sprang for the champagne at the wrap-up meeting. Was a nearly 5% per year increase necessary? 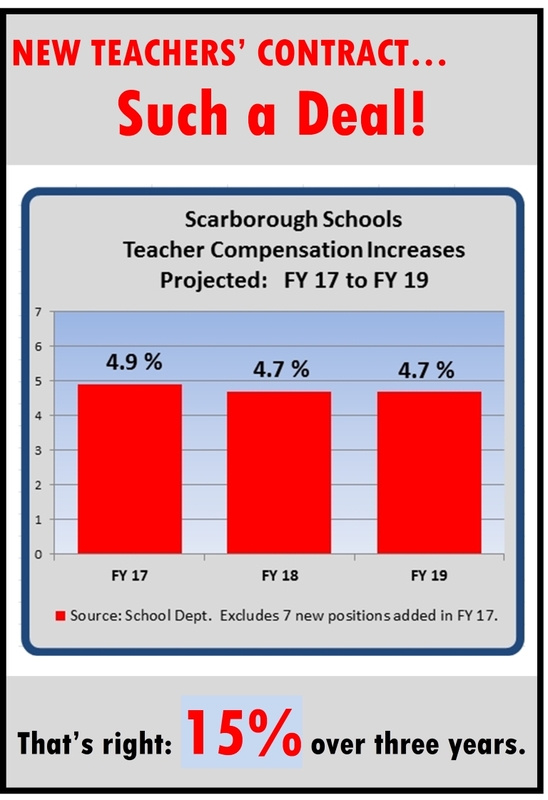 The primary argument justifying the salary increases was the need for Scarborough to remain (or become) competitive with other school districts in the area. Then the union selected the districts to which we should be compared and found us woefully lacking. So if our salary scale is so low compared to surrounding communities, we must be losing teachers in droves, right? Well, apparently not. 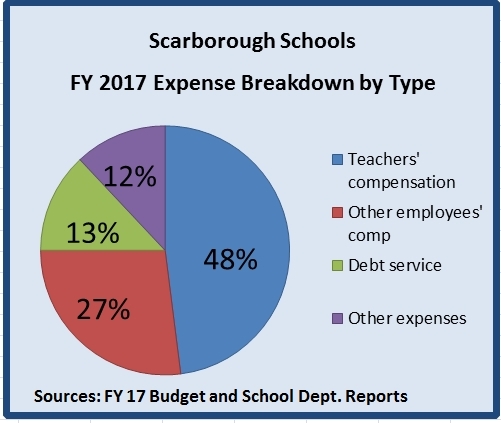 The superintendent’s report on the teachers’ contract noted that 61% of the current Scarborough teachers have been here for 16 or more years. And that teacher turnover last year for reasons other than retirement – which can include a number of reasons besides getting a higher paid position elsewhere – was 5.6%. Those statistics don’t exactly suggest a groundswell of teacher dissatisfaction with the school system or its pay scales. Nor do they appear to support the need for a 15% compensation increase over three years. Once again, we find ourselves potentially in the unenviable position of being labeled anti-something. Anti-teacher or anti-student. In fact, we are very supportive of the fine group of teachers that continue to provide a very high quality education for Scarborough’s students. At the same time, we are supportive of the financial concerns of all Scarborough taxpayers. 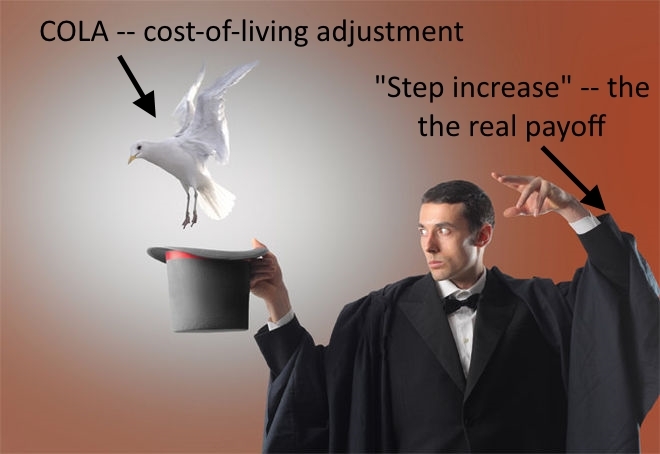 Not just retirees on fixed incomes. But also families with kids. And single folks. All of us are impacted by tax rates that significantly exceed inflation. There’s no question that the teachers deserved a pay increase. The only question is: how much? Would 3% have been reasonable? Did the School Board have a total increase target before entering the negotiations or was it a money-is-no-object strategy? We do understand that the School Board’s responsibility is first and foremost to the students. But the taxpayers of the community deserve some consideration, too. Did we get that consideration in a contract that increased total teacher compensation by 15% over three years? We don’t think so. But at least one School Board member thought otherwise, enthusing about the contract that “we’re getting a deal.” Some taxpayers question the type of “deal” we got. Please don’t take our word for any of this. Check out the video of last Thursday’s School Board meeting on Scarborough Community TV. The superintendent’s presentation begins at about 19:30 on the video and the School Board discussion starts at about 01:03:45. Just another reminder that early voting is happening now at Town Hall. (The schedule is in the last blog.) If you have already voted, thank you! 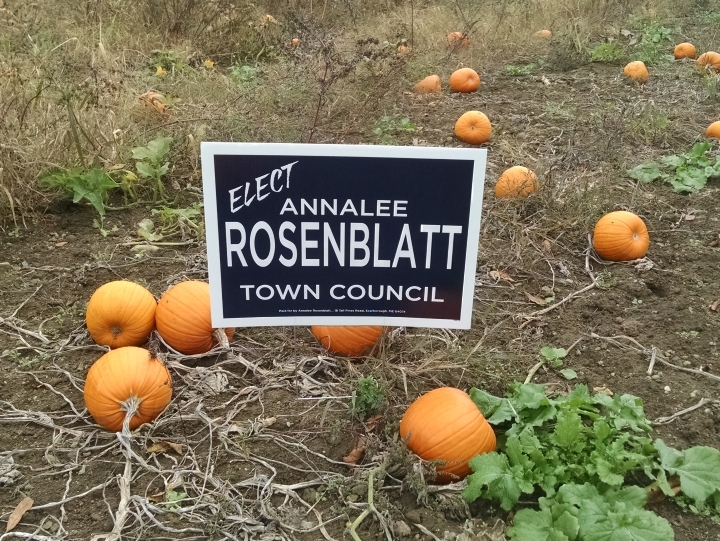 Please consider voting for Annalee Rosenblatt for Town Council. A labor negotiator by profession, she has lived in Scarborough for more than 30 years. She will be a strong voice for fiscal prudence in Town affairs. Her impressive record of public service and her positions on many issues are at her website: www.AnnaleeForCouncil.com. Please check it out. That’s it for now, folks. More excitement is sure to follow! Disclaimer: The opinions expressed in this blog, as well as any forward-looking assumptions or projections, are solely those of the author. This entry was posted in Uncategorized on October 25, 2016 by Site Author. The School Board’s Negotiations Committee consists of: Jacquelyn Perry (Chair), Christine Massengill and Kelly Murphy. I presume they also engage a professional negotiator, but based on the outcome, one has to wonder what that person’s role really was. Do we know who did the negotiating on the management side?